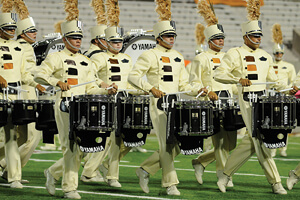 No one who was at the 2008 DCI World Championships in Bloomington, Ind., will ever forget the intensity on the field during Phantom Regiment's Finals performance of "Spartacus," or the audience reaction when the corps was announced in 1st place over Blue Devils by the scant margin of 0.025, a quarter of a tenth. Regiment was 3rd in Quarterfinals and 2nd in Semifinals, ending the Cavaliers' reign of top two finishes for the entire season up to that point. 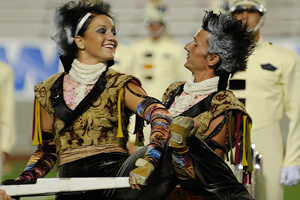 Another corps that had momentum on it side was Madison Scouts, who finished in 12th after placing 12th in their home show in late June, falling under three corps that would not make the Finals in Bloomington; Spirit, Crossmen and Troopers. Fellow Wisconsin corps Blue Stars pushed into 8th place after last being in the World Class Finals all the way back in 1979. Carolina Crown's 4th place show, "Finis" (Latin for "the end"), was comprised solely of endings of great pieces of music—lots and lots of endings. It was kind of like reading just the last pages of lots of great books. A delicate balance of humor and sophistication made this show one chock full of hummable moments. The production opened with Leonard Bernstein's "Overture to Candide," or at least, the ending of it. The operetta was based on the writings of Voltaire, which, surprising to today's fans, was quite a bust after its Broadway opening in 1956. Somehow, this piece segued right into a lesser-known bit of J.S. Bach's "Toccata and Fugue in D minor," originally written for organ, which then moved into Gioachino Rossini's overture from the 1816 comic opera, "The Barber of Seville." If you're still following along, the Rossini moved right into Ludwig van Beethoven's "Ninth Symphony" ("Ode to Joy"), premiered in 1824 by the time the composer had become profoundly deaf and regarded by many musicologists and other music lovers as the greatest piece of music ever written. This work blended into the "Wedding March" from Felix Mendelsohn's 1826 concert overture to "A Midsummer Night's Dream," based on a Shakespeare play and written when the composer was only 17 years old. And somehow all that concluded with a classicized rendition of the call and response, "Shave and a Haircut, Two Bits." If you've seen this show, no explanation of how this all fits together is needed. If you haven't seen it, none is really possible. The second segment of the program started with a tender and lovely mallet rendition of "Claire De Lune" from Claude Debussy's "Suite Bergamasque" from the early years of the last century, with half the brass players entering while lying on the ground. As opposed to the opener, this selection sounded like it was going to be played more in its entirety than just a short snippet, until it somehow seamlessly transformed itself into Leonard Bernstein's "One Hand One Heart" from the 1957 smash hit, "West Side Story," and just as quickly turned back into the Debussy. When the audience thought they had the piece figured out, it morphed into "Somewhere" from "West Side Story," then, naturally, finished as the Debussy once more, overlaid upon "Somewhere." A drumbeat intruding upon the end of the prior piece led into Franz Lizst's "Hungarian Rhapsody No. 2," part of the set of 19 "Hungarian Rhapsodies" composed over several years in the mid 1800s. During the future of the tuba section and drums, one could have been forgiven for wondering why Bugs Bunny didn't show up to take a bow. A little bit of "Candide" and "Ode to Joy" quickly led into Dimitri Shostakovich's "Festive Overture," written in 1954 in just three days upon request from the director of Moscow's Bolshoi Theatre. This was followed by a company front—with the horns stepping over the color guard rifles—during the climax of Tchaikovsky's 1880 landmark, "1812 Overture," written to commemorate the Russian defeat of Napoleon. But wait … there's more! The "Shaker Hymn" theme of Aaron Copland's 1944 "Appalachian Spring" was overlaid atop the Tchaikovsky, which, as the brass players stood in an outline of the corps' patented "crown" formation, developed into the ending of "Hallelujah Chorus" from George Frederick Handel's "Messiah" of 1741, written in English by a German composer who had lived in England for many decades and who had been most famous for his Italian operas. Such a schizophrenic musical background fit perfectly as a climax for a show that was even more musically schizophrenic. As the brass players collapsed into solid block formation of the crown, one could have been forgiven for wondering what was next. But even endings have to end, and it was almost inconceivable when this show actually did put an end to the endings … finally … in the finale … finis. For this week only, you can save on the DVD set that contains this complete Carolina Crown performance, along with all finalists from the 2008 DCI World Championships. Discount DVD offer ends Monday, May 27 at 8:30 a.m. ET.